Christmas is coming - the Coca Cola adverts on TV tell us that, the Christmas music in every shop I walk into, the twinkly lights, the trees and the multitude of letters from school informing me of Christmas fairs/plays/shows/parties tell me that. The bigger boys are excited, they sing the Christmas pudding song as they walk around the house, they draw pictures of Santa and his elves and they write list after list. Finn and Cora are still blissfully unaware but I am sure it won't be long until Finn starts to pick up on the excitement. One of my favouite parts of Christmas is the build up and whilst it can be argued that it goes on a bit too long now (I refuse to start before December 1st), the anticipation is magical. All the activities add energy to what would otherwise be a pretty miserable month of earlier nights and colder days. Christmas spirit seems to infect everyone, we group together, we think of others, we plan ways to make other people smile. As I type this, I am baking a pudding ready for 'Christmas 1' with the Pogues classic number playing in the background. My little sister is heading off to France for 5 months over the winter so we are having a full Christmas celebration before she goes. Roast turkey, pigs in blankets, Christmas crackers, silly jokes, party hats, the lot. I can do nothing but accept it is already Christmas as early as December 4th. Our house hasn't had the full treatment yet, I am reluctant to provide Finn with something else to climb on and I dread to think how long our tree will look pretty for before three small boys mess it all up. We don't send or receive many cards and the tinsel is still packed away. We are organised on one front though, our stockings are hanging over the fireplace ready for the big man in red to come and visit. 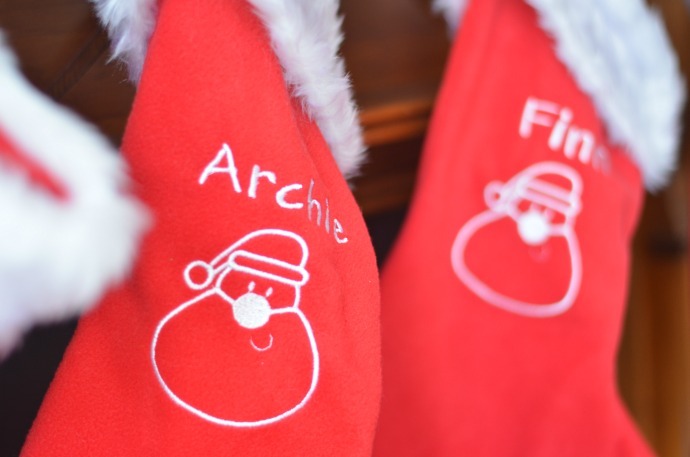 The children were each sent a personalised Christmas stocking from Arty Apple and they were so excited to open them up and get them ready for Christmas eve (the real one on the 24th, not Christmas 1 eve). Whilst Dylan and Archie are spoiled for choice when it comes to personalised items, I think Finn and Cora are going to find it much harder and it is lovely to have something like this that we can bring out every year. At the moment this is as far as our decorating has got, but I know after our Christmas 1 I am going to be feeling more festive and ready to bring out the rest of our decorations. Whilst the rest of the world is enjoying a normal Sunday and getting ready for Christmas, we will be celebrating it early, enjoying the desserts that are *definitely* going to turn out as good as the pictures online and enjoying an important family day whilst we are all around. 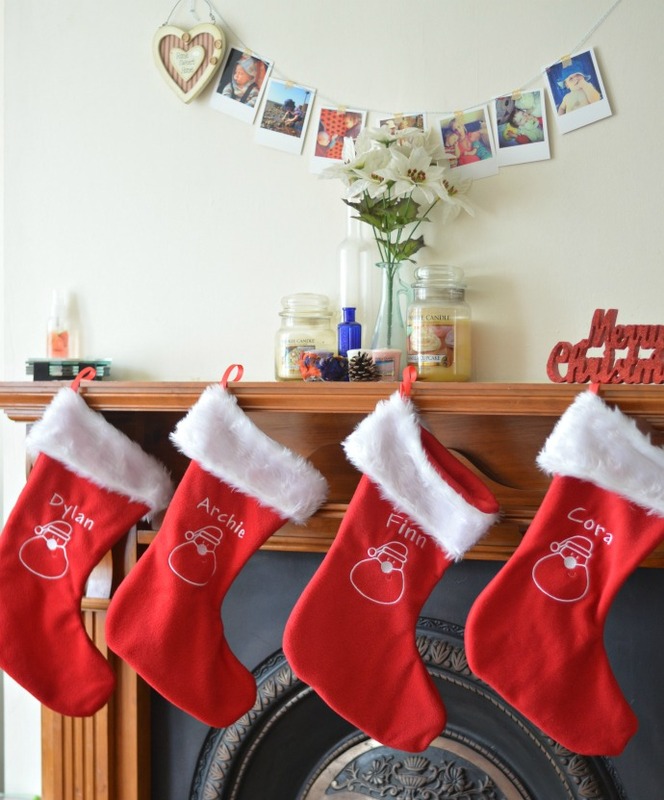 Thanks to Arty Apple for the stockings - we love them! So soft and well made and perfect for four small children hoping for some gifts on Christmas morning. Happy Christmas 1!! I think it's a fabulous idea and the stockings are lovely. At home we're on a not before 12/12 because of Elma's birthday but my office tree was up by 8.20 on the 1st! Ah what gorgeous personalised stockings - off to have a nosy now. 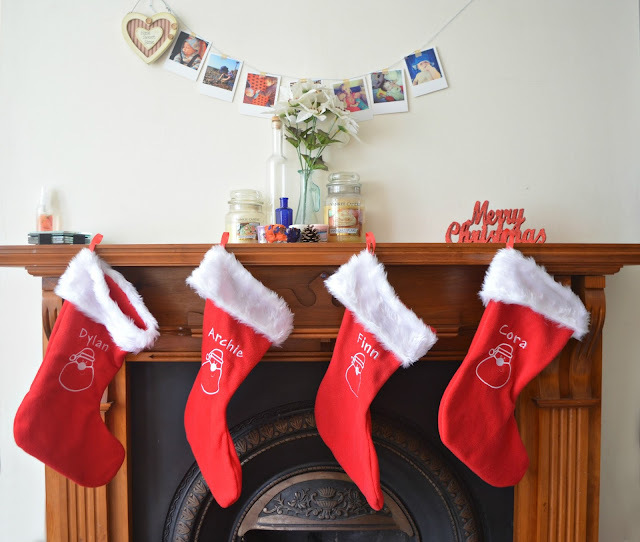 Lovely stockings, they simple and simply nice-looking....my little one is just three and is excited about the Christmas gift!